When Pixar first arrived with 1995’s Toy Story, they fell into a steady release routine and reliably output a movie every one to three years. 2006 began the eight-year streak in which the animation giant dropped a new title every summer, all the way up to 2013’s Monsters University, which came out amid peak Pixar anxiety as everybody nervously wrung their hands over the company’s supposed creative death. So seeing the studio pump out two original movies in one year is a pretty big deal just on the basis of scheduling. But that neat trick has turned into what amounts to an artistic net zero for Pixar, because Peter Sohn’s The Good Dinosaur, Pixar’s November offering balancing out June’s Inside Out, isn’t all that good. It isn’t especially bad, either, but let’s face it: Inside Out was always going to be a tough act to follow for The Good Dinosaur, even in a best-case scenario where the film wound up living up to its title. Inside Out is an imaginative success that Pixar’s competitors won’t be able to replicate without looking like burglars—The Good Dinosaur, on the other hand, is a direct ancestor to films like 2000’s Dinosaur, and, most importantly, the entire The Land Before Time franchise. It’s a simple story with a simple formula derived from an oft-used setting in animated children’s fare. In a way, that’s fine. Pixar’s bread and butter has always been taking the familiar and making it feel fresh, and The Good Dinosaur, disappointing or no, is a beneficiary of the company’s distinguishing magic. But it’s still a dino-flick about a boy and his dog, here repurposed as an apatosaurus and his human. Arlo (Raymond Ochoa) is the youngest child of Poppa Henry (Jeffrey Wright) and Momma Ida (Frances McDormand), two apatosauruses living off the land on their farm. Arlo is a gawky, runty sort, a scaredy-cat by birth who’s literally terrified of coming out of his shell when he’s born. Henry gives him patience: He believes Arlo will come into his own and earn his place as a member of their clan in due time. But the dino-boy isn’t even able to feed their chickens without incident, so when Henry tasks Arlo with killing the “critter” that’s been feeding off their corn supplies, he’s setting the boy up for disaster. Arlo can’t bring himself to off the animal, which happens to be a feral human child, which sets off a chain of events that ends with Henry’s death. It’s a sudden moment right out of the Lion King playbook, and in a vengeful fit of pique, Arlo chases the caveboy down, only to fall into a river and be swept far, far away from home by its currents. He’s forced to work with the kid to survive, but the good news is that the kid, eventually dubbed Spot, sees Arlo as his natural master, and performs tasks like hunting, gathering and tracking at Arlo’s behest. The bad news is that all the scent following in the world can’t help them find Arlo’s home. So adventure ensues as the unlikely pair strike out into the prehistoric landscape, which isn’t actually prehistoric at all. It’s Earth if that pesky ol’ Chicxulub asteroid hadn’t smashed our planet millions upon millions of years ago and wiped out the dinosaurs. 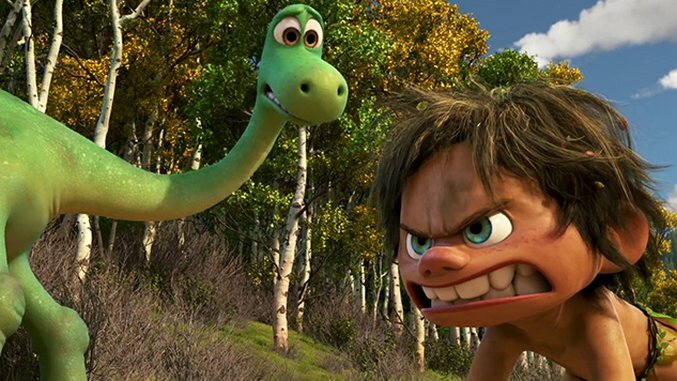 You’ll probably walk out of The Good Dinosaur wishing that the film had explored that idea more: We’re introduced to Henry as he sows seeds in a crop field, and we meet pterodactyl storm chasers, T-Rex wranglers, and raptor rustlers on Arlo and Spot’s journey, but aside from acquainting us with these characters, Sohn and screenwriter Meg LeFauve do little else to expand on their premise. You get the sense they came up with The Good Dinosaur’s basic conceit just to dodge scientific criticisms from Neil Degrasse Tyson. There’s no consistent tone, either, though as a caveat this is probably fine: The Good Dinosaur is clearly more calibrated for children than for adults. As the story caroms from comedy, to tragedy, to beats of pure horror, and opens up to make room for drug jokes (Arlo and Spot eat some suspect fruit and trip balls for a minute or so, which is twice as hilarious as it sounds), you can feel Sohn trying to establish a groove where the disparate emotionalism gels. There’s no substantive connective tissue that links Arlo’s initial encounter with the pterodactyls, led by the psychotic Thunderclap (Steve Zahn), to his cattle herding exploits with the Tyrannosaurs (Sam Elliott, A.J. Buckley and Anna Paquin). These scenes just happen—it’s all incident—and while the film’s willful genre hopping isn’t especially disruptive, it is distracting. By consequence, The Good Dinosaur doesn’t make for especially satisfying viewing. More emphasis on the bond between Arlo and Spot would have helped, though their relationship is the best-developed element in the entire film. Individual sequences, particularly a terrifyingly clever moment where pterodactyl beaks pierce storm clouds like shark fins, work like gangbusters. (Disclosure: Think twice about bringing your tots to see this movie. It’s frightening with surprising frequency.) It also goes without saying that the movie looks gorgeous. Early on, Henry takes Arlo for a nighttime stroll to teach him about facing fear, and the film puts on an absolutely stunning light show courtesy of a field of fireflies. Beautiful though it may be, The Good Dinosaur is lacking, not just compared to Inside Out, but to the best of Pixar’s filmography. Maybe it’s too much to expect two meteoric films in one year.